For the first release of this event series, see: here. What better way to start off the snowy month of December than with a new Horsemen event! And it just so happens, this one is located out in the snowy reaches of the East, the Castle of Conquest! Specifically, the areas around it: Snowhead. The castle and it's grounds can be reached much like the others: During events night using the warp at the top of the Keep of Time, the warps in the Citadel, or via it's nether portal, linked out of UnknownEntity's Divine Trans Hub. 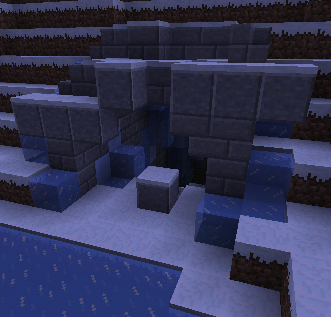 This event focuses on the Temple of Ancients, whose entrance can be found at the end of the frozen river that runs next to the castle. This event is designed in the flavor of old-school MMO grind dungeons, where you defeat waves of opponents to collect enough drops for a greater prize. In this release, we start to more heavily dive into the building lore, which you can read more about on this page. Chapters 2 and 3 are now available! Of new loot, the Warpriest armors are now available; slightly weaker in defensive measure then the Barrows armors (while still as strong as conventional armor), with one major perk: these armors are unbreakable! Also available to create are the Godswords, powerful new swords specialized after each of the four Gods involved in the temple. For further details on all the items available, please check the newly added areas in the Cavern of Science, or directly from their villagers on the second floor of Moosemart, and of course at the event site itself, at the village of Naragun. And of course, if you have questions, throw them at your nearest Horsemen! Part of what this (and the last) event added are these stands for Lorebooks; written books that add more insight into the areas they describe and are even collectible in a series of sorts. 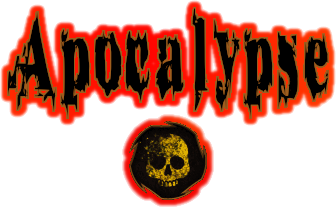 There are two kinds of books: the Apocalyptic books spread out across the world, at the locations they describe (released along with their corresponding events), and the Archive books, which are added to the stands at the Citadel once the next event has been released. 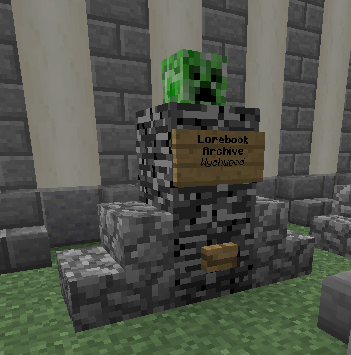 You can identify which books have been filled out at the Citadel by the creeper heads posted on the stands (See pictured above.) Finding all the Apocalyptic books may even be an achievement in of themselves... if you get my drift! In addition to the Lorebooks and the new additions in the Citadel's two main areas, Conquest's Quest Board is now open with another set of Horsemen Quests; take a look if you're out there! See you again on February 1st for the next event release! This month is a special month for the Lodge, where two raid bosses are available! This month, Santa and his minions are looking for a fight, and elsewhere, the boss of the Overlook Hotel is out for blood. Make sure you make your way out and give these a go! The Raid boss button will spawn both these groups, so make sure you hunt well! A new UHC world is available for the month of December. It’s getting cold out there, so please be careful to keep warm… or not to slip and fall off!